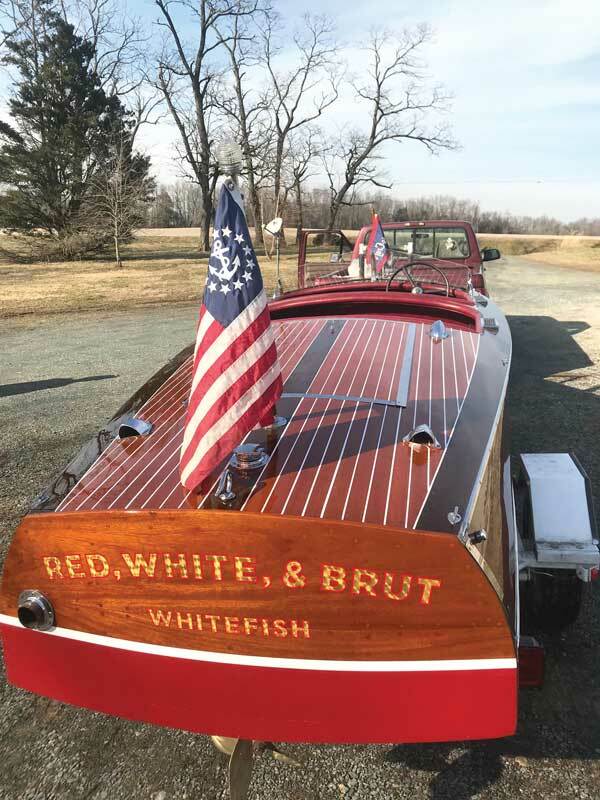 She’s sweet, 17 (feet) and 77 years old, yet truly young at heart: a World War II era Chris-Craft runabout with a signature shine that glistens in the sunlight. I paid her a recent visit as this Chesapeake Bay gem was about to be shipped from the Chester River to her new home on a lake in Montana. This World War II era Chris-Craft runabout is a sparkling gem. I was mesmerized by how fluid her finish was. I’d equate the quality of her varnish to a Steinway piano. The lettering on the boat was gold leaf, properly outlined to stand out. Both the varnish and the gold leaf reflected like a jewel. At that moment she was more a piece of art than a pleasure boat. A freshly stripped, sanded, re-stained and varnished wooden boat easily warms a boat lover’s heart. The refinish work was done by George Hazzard and his Wooden Boat Restoration crew in Millington, MD. His shop used his paint and varnish spray booth to apply her 15 coats of varnish. Lots of labor, skill, time, and expert craftmanship, coupled with the dust control of that booth can be credited for the melt-in-your-mouth finish that this boat enjoys. Tim Grant of Grant’s Sign and Lettering did the gold leaf work. I was also impressed by how the right finish work can make an entire boat feel completely fresh and new. This time around it was not the cockpit—a front and back bench of inline seating that seats five was re-done in the 1960s. Nor was it the instruments, which are original from 1942. With the exception of a minor correction to the crash pad (the cushioned area of the deck that surrounds the cockpit) we essentially have that piano finish and the gold leaf to thank for elevating this boat to a new level. Since she’s a runabout, everything is decked over except the double row of seating. If she had walk-around space in the cockpit with a box over the engine, she would be called a utility, as most Century boats are. This sparkling gem is a mahogany-planked boat. She has her bright finish stained in two tones, with the center king planking and the covering boards a darker shade of stain to add interest to her all-varnished finish. Her double-planked bottom and single topside planking is backed up by small battens over their seams. She is 17-feet long with a beam of five feet, eight inches. She weighs around 1800 to 1900 pounds with the six-cylinder engine. That stern has a 14-inch drop in freeboard compared to the bow. She is framed in oak that is screwed, not glued together. That allows for easy disassembly and restoration. The level of attention may take some time, but the life of the boat can be extended indefinitely. During World War II, Chris-Craft built boats based on their own designs, as well as landing craft for beaching once invasions in both theatres needed to get the troops from ships to land. Chris-Craft actually returned some of the money they’d already received from the U S Government once they realized that their boat building efficiencies allowed them to build what our military needed at a lower cost. Chris-Craft built around 12,000 boats to support our initiatives during World War II. It is a joy to ride in a runabout with the wind in your face. She is easy to maneuver into tight turns, quick to plane, and very responsive to throttle inputs. As a small boat she allows you to feel like you’re one with the water and all of nature, feelings that are integral to the joys of boating no matter where you call home. For more Classic Boat features, visit our Boatshop Reports.